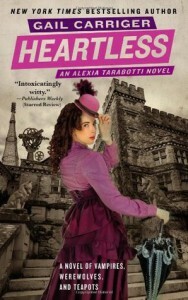 9/10Gail Carriger did it again! And I think it is safe to say that the Parasol Protectorate is one of my favorite series ever. Every time I read one of these books I get a strange craving for tea and my inner thoughts have a slight British tinge to it. I also get this goofy grin on my face when a favorite character does something that is… oh so them, and I think it is safe to say that guilty pleasure describes these books great.Heartless was fantastic! Chaos is in full swing as always, lots of tea is consumed and the boundaries between what is proper and what is practical is pushed. It might be my favorite of the series so far, because the action and humor were always in good supply. Alexia makes it all up as she goes, whether is is plans to save the world/queen/pack or making up excuses for her snooping. I also enjoy how even though everyone is always trying to kill her she doesn’t hold grudges and understand the assailants reasoning.If I can’t have Hogwarts, can I please live in this steampunk world and have Lord Akeldama as my bestie?